We would like to thank all the partners of the show! If you're looking to partner with the Fantasy Football Fellas podcast, please contact us at thefantasyfootballfellas@gmail.com. 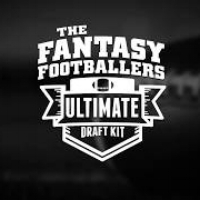 The Ultimate Draft Kit from our friends at the Fantasy Footballers is the premier draft kit on the market. Including rankings, projections, video profiles, and of course the exclusive Reception Perception from Matt Harmon. This digital draft kit our preforms those newsstand magazines AND is update throughout the draft season. Grab your copy today by following the link below and using the promo code FFFellas for 10% off at checkout. Of course we all love draft day. But now, with the Draft app, you can enjoy the excitment of draft day, each and every week througout the season. The easiest way ever created to play daily fantasy sports now features Best Ball leagues! Use our promo code FELLAS for a free entry on your with your first deposit! Fantasy Champs is the place to go for your fantasy gear needs. They have trophies, plaques, rings, belts, draft boards, and you can even customize your own jersey for your fantasy team! Check out fantasychamps.com and use promo code FELLAS to save 10% on your order! As seen on the Fantasy Football Fellas mock draft shows, Fantasy Pros' Draft Wizard is a tool that makes it simple to prepare for and nail your fantasy football drafts! Use the My Playbook tool to keep track of your leagues and nail your waiver wire. If you're interested in a Premium Membership, clink the link below and use the promo code FELLAS at checkout.